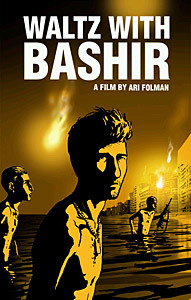 Waltz with Bashir (2008, Director: Ari Folman): I think calling this an animated documentary might be stretching it a bit, but director Ari Folman has created something really interesting. He’s used animation to go where documentary filmmaking hasn’t been able to take us before, into the memories, dreams and nightmares of its subjects. The film starts when Ari (looking uncannily like Italian film diarist Nanni Morretti) shares a drink with an old army buddy who describes his recurring nightmare of being chased by 28 dogs. After finding out that this relates to specific incidents from the 1982 Lebanon war, we discover that Ari Folman has little recollection of his participation in that conflict. But after this meeting, he begins having a strange recurring dream and after consulting a psychologist friend, he decides he needs to try to figure out why his memory seems blocked. As he interviews other participants in the war, he begins to piece together his part in a larger narrative, that of Israeli compliance in the massacre of thousands of Palestinian refugees in the Sabra and Shatila refugee camps in Beirut. “Christian” Phalangist militias entered the camps and massacred men, women and children for three horrific days, killing more than 3,000. Despite the militias’ stated aim of rooting out Palestinian fighters, the vast majority of these fighters had been evacuated weeks before. The bloodbath was widely seen as revenge for the assassination of the Phalangists’ leader, the recently-elected President Bashir Gemayel. Although Folman’s memory is never completely reliable, he seems to remember his army unit firing flares so that the militias could carry out their work at night. The most shocking moment of the film comes right at the end, when the animation suddenly snaps into real-life video footage of the carnage, leaving a dramatic impression. Despite the unreliability of memory, and the nature of guilt (both survivor guilt and that of someone who killed other human beings) and its effect on the mind, this footage is evidence of a real atrocity, and Folman and his comrades have had to live with their part in this tragedy for more than twenty years. It’s no wonder that he used animation; it’s the perfect way to recreate nightmares. Unfortunately, the director flew home after the film’s opening screening and wasn’t present for a Q&A. This entry was posted in Documentaries, Film Festivals, TIFF and tagged #tiff08, guilt, israel, lebanon, memory, palestine, war. Bookmark the permalink.